A big hello to all of you who kept visiting this humble space of mine despite me abandoning it midway:).Thank you to Sharmilee,Suma and Sanjeeta who helped me out through the no-posts phase.I owe you gals big time! !I am yet in a confused state since my oven is yet to arrive and I am yet undecided about a high end camera.Well,to cut a long story short,I've decided to start blogging as I slowly iron these issues out. Blink and February is here.The(so-called) month of love where you see heart shaped balloons all over the place and heart shaped anything is up for sale,except the heart of course;).I would have loved to bake a cliched heart shaped cake,cookie etc,but since that is not possible right away,I thought of this ever-popular Indian sweet Gajar ka halwa aka Carrot halwa. Of all the halwas I've eaten,I would say my sis-in-law Soumya's halwa is the best[and no this is not to soap-marofy her,she doesn't read my blog;)].It is of the right consistency,not overtly sweet and just perfect on its own.Some time back when Ajay was home,she sent me a small dabba of gajar halwa neatly packed and it was gone before you could even spell gajar halwa,it was that good. 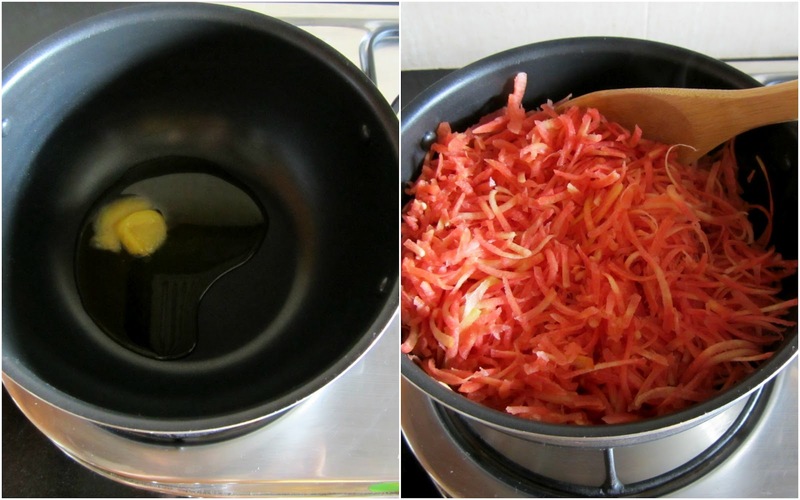 Armed with a kilo of carrots,I called her up and asked the recipe for the umpteenth time while preparing it.I should say it tasted great,but it didn't match hers in comparison.Since I am not giving up trailing the-perfect-gajar-halwa,I decided to try it again,this time using Delhi carrots. Like she told me-grate the carrots,cook in enough milk,add sugar and finally add ghee when it dries up.Garnish with nuts if you like,that's it.Oh,I wish it was as easy to make! 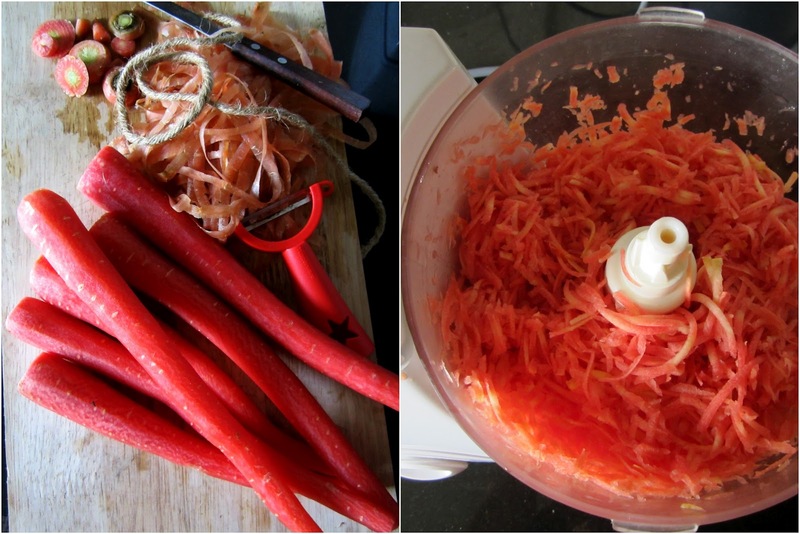 !Thanks to my food processor,grating the carrots was a 2 minute job.Or else it would have taken the joy out of making this one. 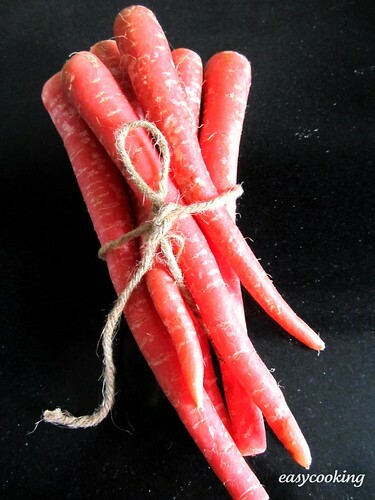 Wash and scrub the carrots well under running water.Snip the ends and peel.Grate using the medium grater attachment of your food processor.Or use a box grater. In a thick bottomed kadai(I used non-stick),add a tbsp of ghee and saute the carrots for 3-5 minutes,or till the carrots become slightly pale. 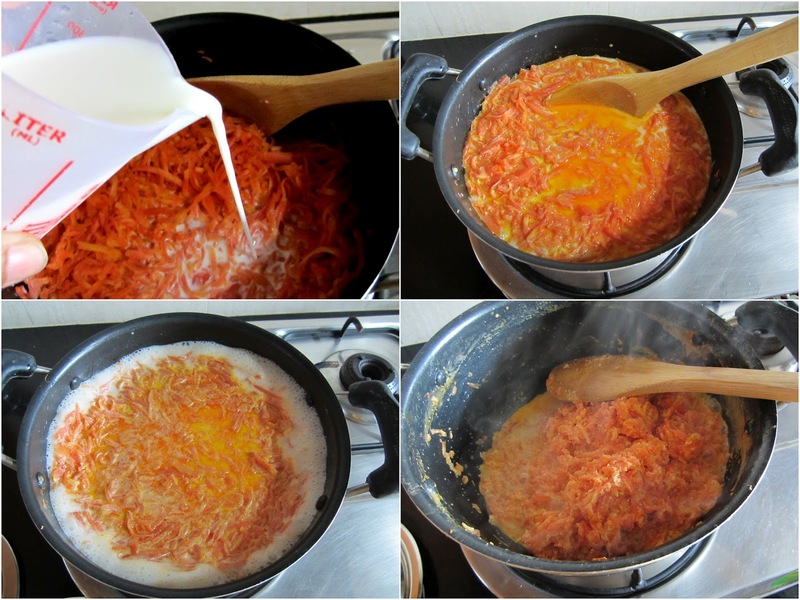 Add milk and give a good stir.Simmer the gas and let the carrots cook in the milk on a low flame.Stir once in a while.It will take anywhere from 30-40 minutes to dry up,so it helps if you are using a non-stick pan. Mix in the sugar and stir well.The mixture will again liquefy now and change in colour.Let the sugar dry up now-about 7-12 minutes.Now add ghee a tsp at a time till the carrots gets a nice glaze and dry up completely.A little liquid at the bottom of the pan is fine since it will continue to cook as it cools down. In another pan,add a tsp of ghee and roast the chopped cashews till they turn golden brown in colour.Now mix in the roasted cashews and the crushed cardamom to the cooked carrots. Crush a few saffron strands in your palm and mix in that too(not in the picture).Let it cool for a while. You could try making the same halwa using regular carrots too.I've tried with both and personally did not find a great difference in taste.Another variation is using grated beetroots in place of carrots,a red halwa-perfect for valentines!! I would strongly recommend using a non-stick pan since the stirring procedure is minimal.You could go on with your regular chores and need to check this only once in 5-7 minutes or so-something not possible with a regular kadai. Milkmaid/condensed milk could also be used to enhance the taste and texture.If you do,adjust the sugar accordingly. If you like the flavor of cloves,add a couple into the milk while cooking the carrots and remove them once the halwa is ready. Garnishing with nuts is optional as I feel the halwa tastes equally great without it too. I hope you have noticed,divyascookbook is now a dot com.Yeah,pretty late but nevertheless.Thanks again to all of you who kept checking on me.This is for you guys. 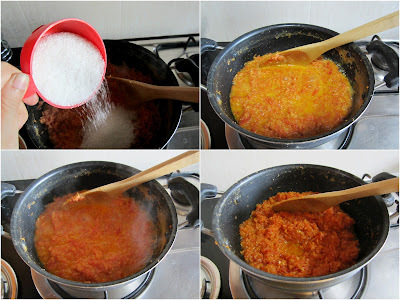 Welcome back after a break divya.....ur post were surely missed....congrats on ur dot.com as well and looking forward to many more recipes n yup gajar ka halwa is a fav too and using delhi carrots is always good for this. Welcome back and Congrats on going .com! It was entirely my pleasure to guest post for you Divya! 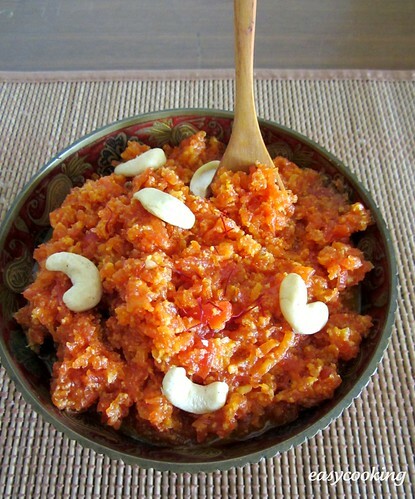 Gajar ka halwa looks superdelicious..
Love the gajar ka halwa, my mom makes it the same way... Addition of cloves is a great tip. delcious halwa! !nice step wise pics!bowl looks very nice dear! 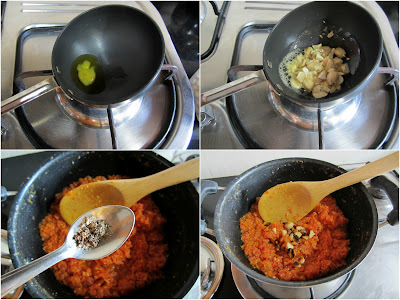 really nice gajar ka halwa....a big favourite in my house!...very nice pics. i tried .. its soo delicious!!!! thanks for step wise pics divya..love it.. Same pinch! Always a pleasure to share and be there for friends, Halwa is yum. Love the bowl with the neck.. simple step by step pictures create magic here..
Hi...awesome...first time to ur blog,...and i am bowled :) can u pls temme where did u buy tat dish from?? the one in the first pic...thanx in advance.. Came out excellent. Thanks for the recipe! I have a question to ask... Can i put the crushed cashewnut at the first time u put ghee before putting the grated carrots? I cook for my daughter....and she loves it.. being a bong who is born & brought up in UP/MP I love North Indian food...and Gajar ka Halwa is just unparallel!!!! 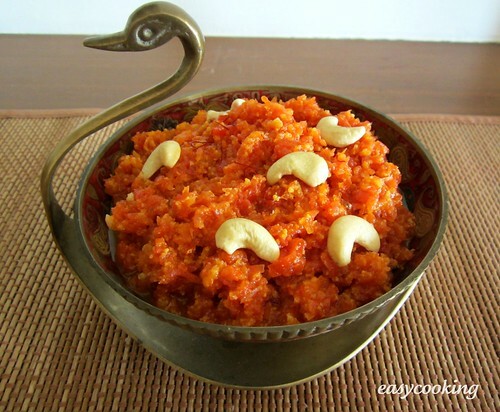 i love gajar ka halwa but the only problem is to grate it . i want to know which food processor should i purchase to grate the carrots. 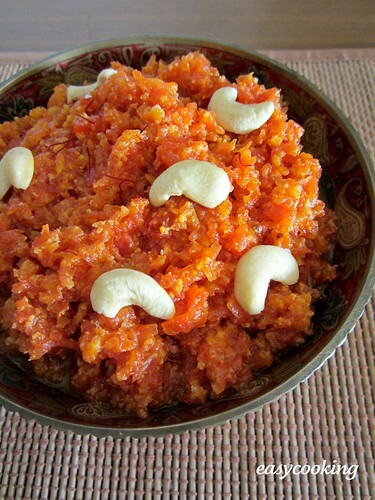 i love gajar ka halwa but only problem is to grate the carrots. i want to by a food processor for it. can you suggest or tell a name /model like yours. Love the recipe and the presentation... the bowl is perfect! I followed your recipe for my first time for gajar ka halwa.It turned out perfect n delicious. My husband n kids loved it.I m going to make it again.thanks for your wonderful step by step with pictures recipe,it helped me a lot. thankyou for mentioning precisely the time required to cook, at each of the phases. that is what makes all the difference in the taste. great job (that yu blogged) and great food photography also ! Great job done!! Making it for my family.... confident will be the best!! All Thnx to you!! How many servings does this recipe make? I want to make it for 12 people so I needed to scale accordingly.